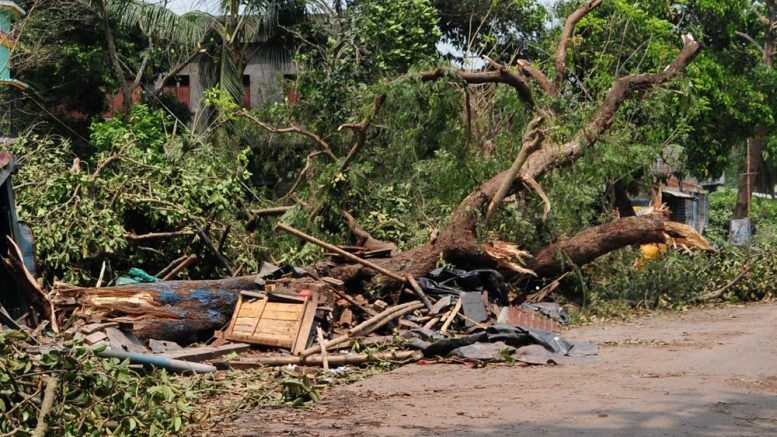 Krishnanagar, April 24: Five persons were killed and six others were injured when a storm accompanied by thunder shower hit several parts of the Nadia district early Sunday evening. Santipur, Chakdah, Ranaghat, Krishnanagar, Hanshkhali, Kaliganj, Karimpur and Tehatta blocks suffered badly as many houses collapsed trees uprooted causing serious troubles to people. Police said, all the five deaths were caused due to fall of trees. The deceased persons were identified as Ramkrishna Ghosh (19), a resident of Ranaghat Dayalnagar, Tufan Ghosh (42) in Dhubulia, Kartick Das (80) in Hashkhali Jhinukghata, Alauddin Sheikh (90) in Kaliganj, Bikas Sharma (50), a resident of Bhimpur near Krishnanagar. The district administration has announced a compensation of Rupees two lakhs to the nearest kin of the victims. “The compensation will be paid after examining the medical records”, additional district magistrate (G) Priyanka Singla said. Nadia zilla sabhadhipati Bani Kumar Roy said: “Several areas in the district were badly affected, even though the situation is under control. So far no need to send relief materials required. Large quantities of agricultural production have been damaged which are being assessed. We will announce necessary compensation after all the reports are received”. Sources in the district agriculture department said that a huge quantity of banana production in the Natidanga-I and II panchayat as well as in Dhoradaha-I and II panchayat were seriously damaged. The storm caused a massive traffic snarl on NH34 as roads were blocked on many areas due to uprooting of trees. Railway communication in Sealdah-Krishnanagar section was also disrupted as overhead electric wires were disconnected due to falling of trees. The district experienced moderate to heavy rains and gusty wind having speed up to 70 km/hour owing to the deep depression, a district official said.